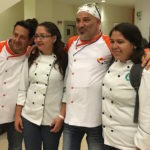 I wrote this post after our media trip that was hosted by the Los Cabos Tourism Board. All suggestions and endorsements are solely personal. Our policy is only to share and recommend what we personally like and have experienced. Sun and fun. Who doesn’t love that? 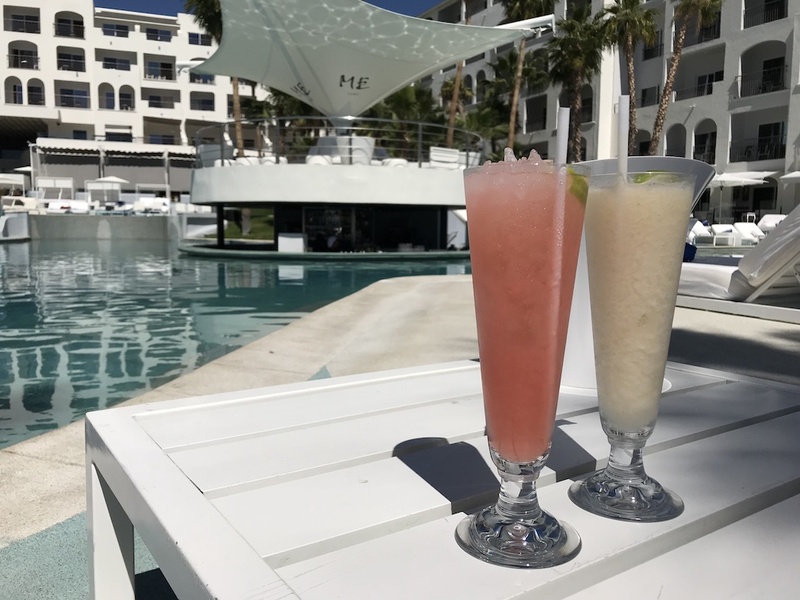 As you know, we like our sun and fun mixed with a good selection of culinary delights and that’s exactly what we found in Los Cabos, Mexico. Those of us who do not live near warm water are magically drawn to the tides and sounds of the waves. Simply being near the ocean is enough to take all your day-t0-day cares away. Getting up early, without a deadline or alarm, just to see the sunrise becomes a daily ritual in Los Cabos. Meeting the sunset with a cocktail or frosty beer in hand while discussing with family and friends how you filled your day is a status meeting no one wants to miss. You’re bound to reduce your stress levels just sitting back, relax and taking in the view. Then you’ll question why you didn’t do this sooner. This is not the place of spring-breakers and all night parties. 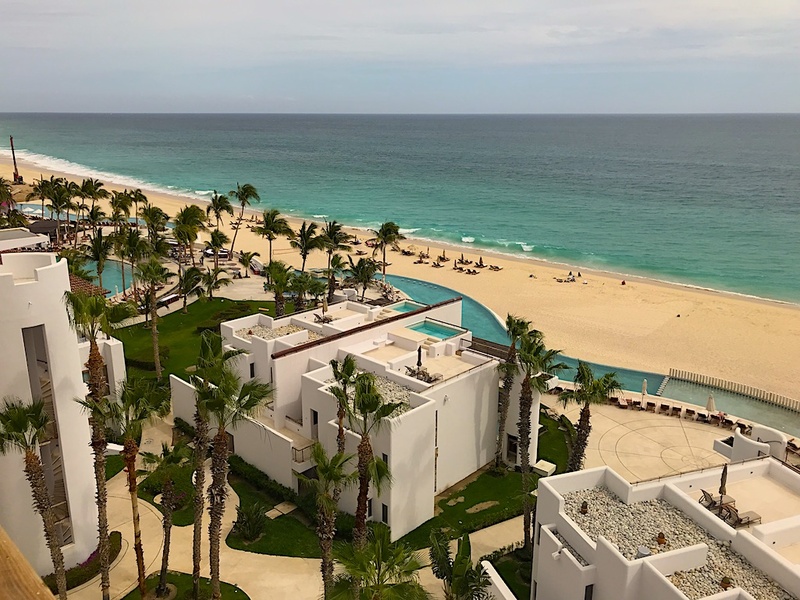 It’s no wonder that A-list Hollywood celebrities like Oprah and Eva Longoria take the two-hour flight to Los Cabo to unplug and unwind. 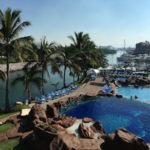 There are many resorts and accommodations to choose from in Los Cabos with more on the way. New hotels like the Ritz Carlton, Four Seasons, Montage, Solaz, Garza Blanca and Hard Rock Hotels are all planned to open in 2018. 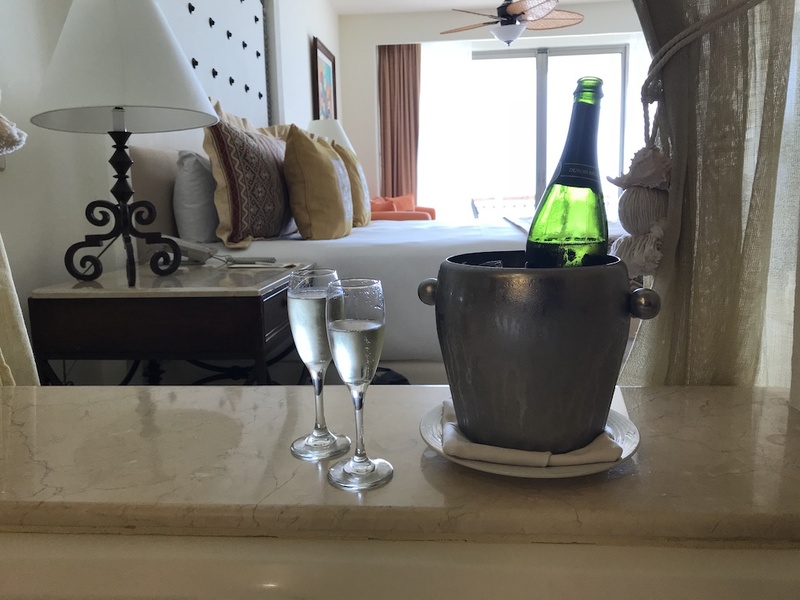 An adults-only, all-suites all-inclusive resort with spectacular views of the Sea of Cortez takes care of everything so you don’t have to. All suites have an ocean front view so even soaking in your in-suite whirlpool tub provides amazing scenery. If you’re like me and really enjoy your privacy and time alone you will love the coffee and tea service that comes delivered to your room every morning. It may not sound very special but it is. They deliver the goodies via a private little butler’s pantry. I swear you don’t even hear them deliver it but it’s nice and hot whenever you open the little door to retrieve your bounty. When you are ready to greet the day (and other people) head down to the coffee shop for freshly brewed espresso, capuccino, coffee or tea. 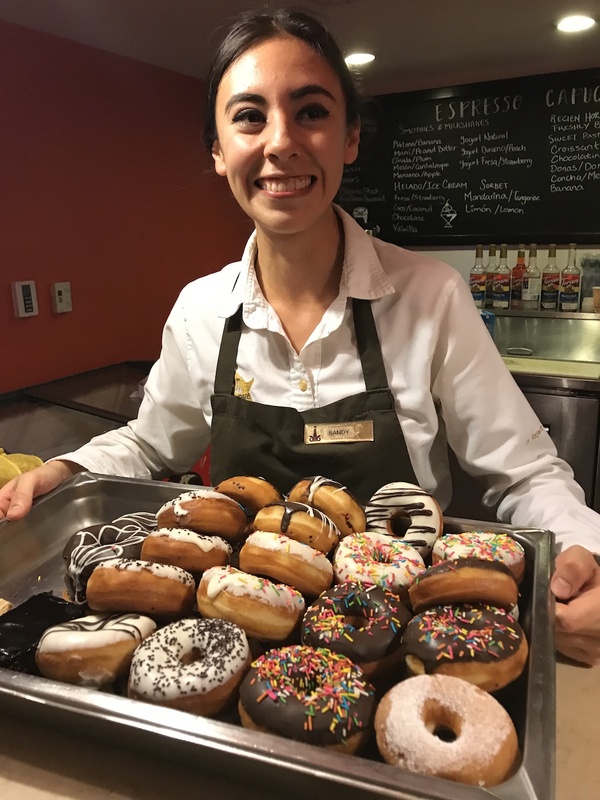 They will also tempt you with fresh made donuts every day and other sweets. If you want something more substantial hit the breakfast buffet in Vista Ballenas. Here you can choose from a wide range of regional Mexican breakfast dishes like chilaquiles, huevos rancheros as well as international foods. Fresh fruits, yogurts, meats, cheeses and baked goods are all out on a beautiful display. Eat inside or outside on the patio with the gorgeous view as your constant companion. The Marquis has five restaurants to choose from including Canto Del Mar, its fine dining French cuisine signature restaurant by Thierry Dufour. 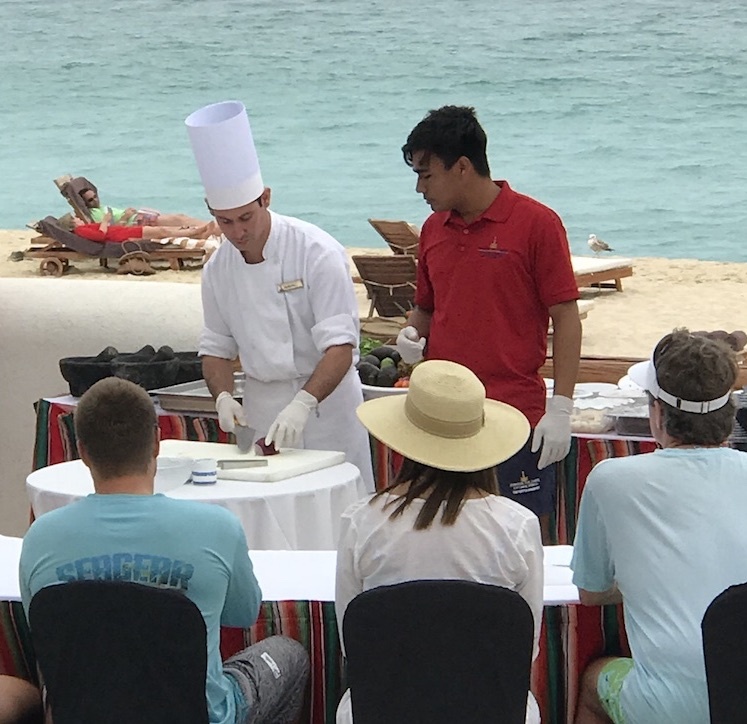 If you like to really immerse yourself in local culture the Marquis offers Spanish lessons, tequila tastings and cooking classes featuring local ingredients. Whether you choose the Pergola for a poolside snack or the Dos Mares restaurant for fresh seafood you can’t go wrong. 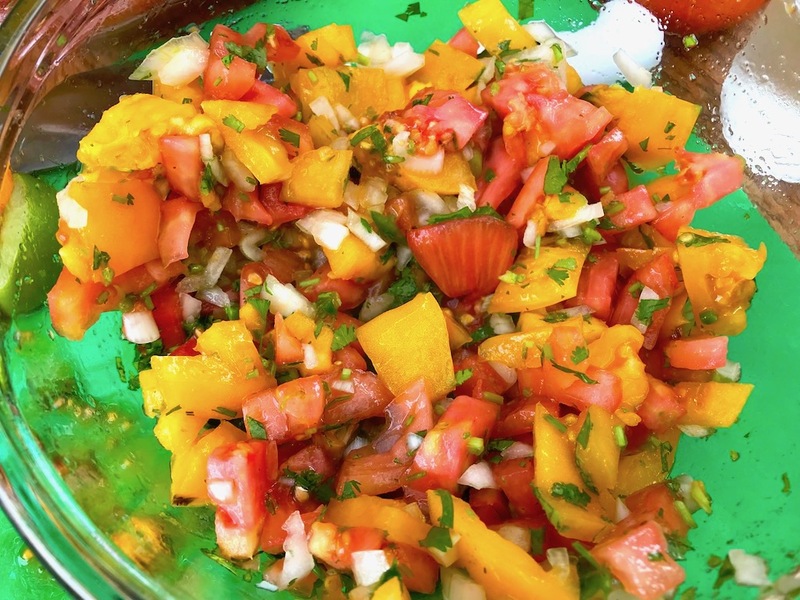 They have a wonderful list of ceviches to please every palate. 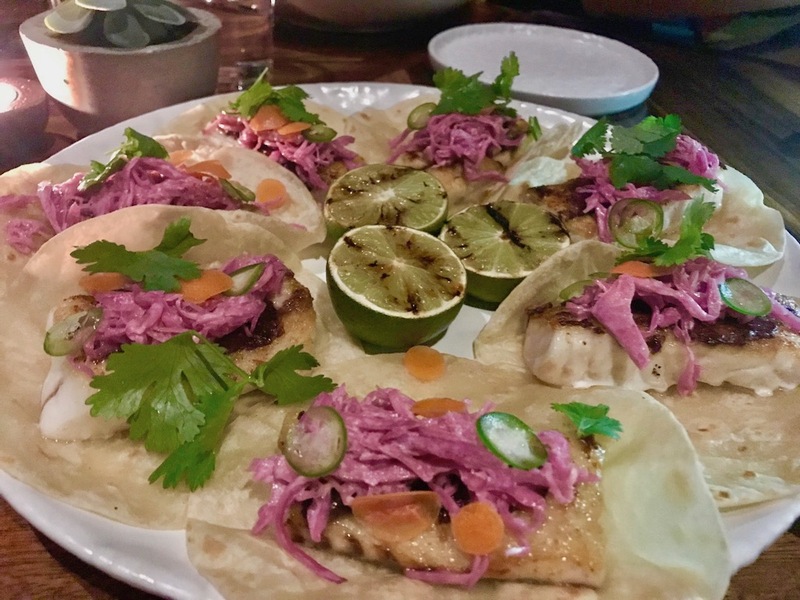 I also tried their fish tacos (something you’ll find yourself eating everywhere you go in Los Cabos), and they were delicious. 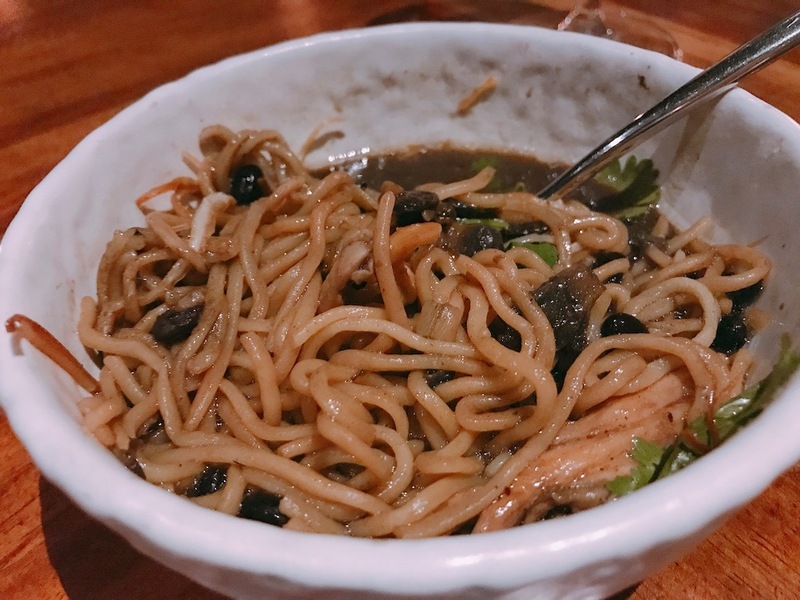 The Sake Restaurant brings pan-Asian style cuisine to the Marquis. 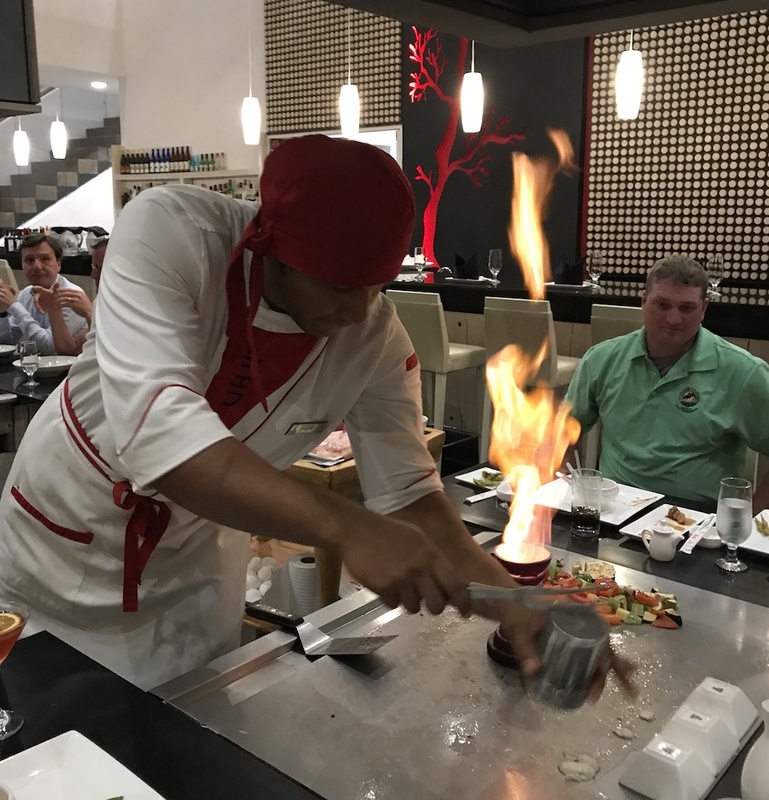 If you’re lucky enough to score a teppanyaki table you will get a dinner and a show from the chef. The contemporary style of the room makes it comfortable and relaxing. Be sure to sample their sushi bar when you visit. 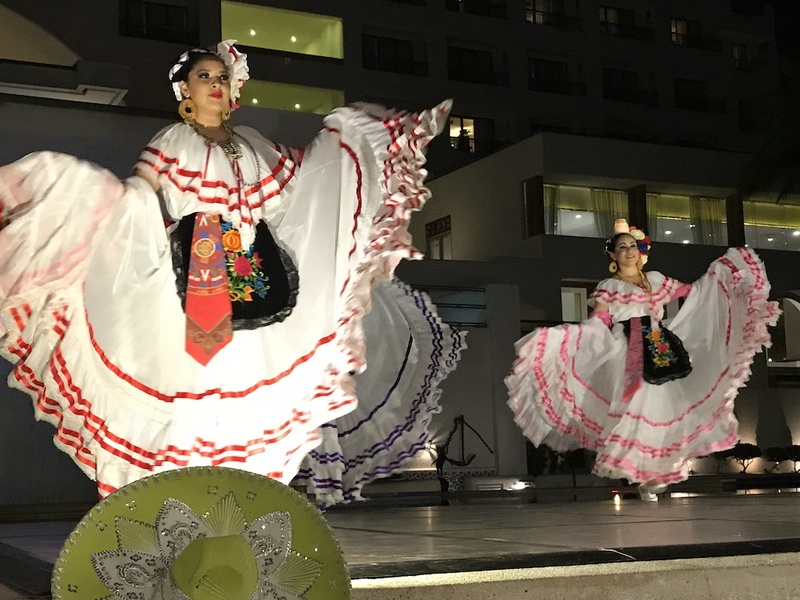 Nightly performances from local dancers and musicians make the atmosphere fun and lively. 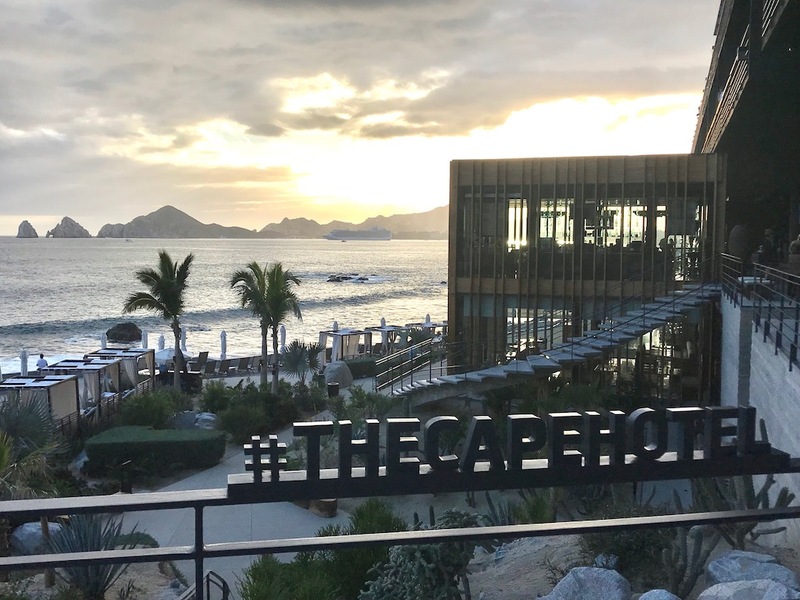 With a spectacular view of the iconic El Arco (The Arch), The Cape is another luxury hotel on the beaches of Los Cabos. Built by architect Javier Sanchez, this property seems to melt into the landscape with stylings similar to Frank Lloyd Wright. 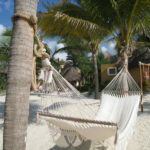 While you immediately have the sense that this is a luxury resort you will also enjoy the relaxed and urban feel. From your cabana by the pool you can enjoy the surfers, who accept the challenge of the waves right in front of the hotel on Monuments Beach. The special treat at The Cape is the Manta Restaurant. 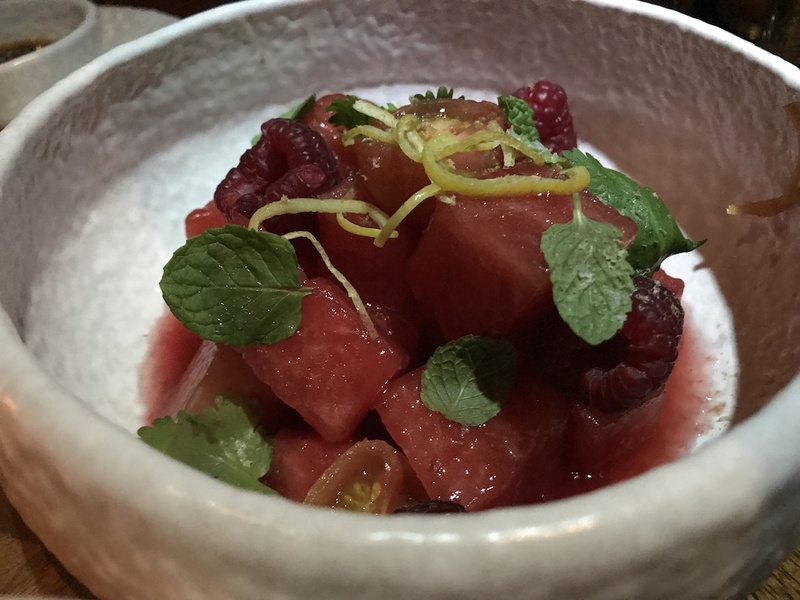 Chef Enrique Olvera has a little fun with the restaurant’s name. He definitively focuses on seafood but also riffs on the “manta,” Spanish for blanket, comfort of the food he presents. 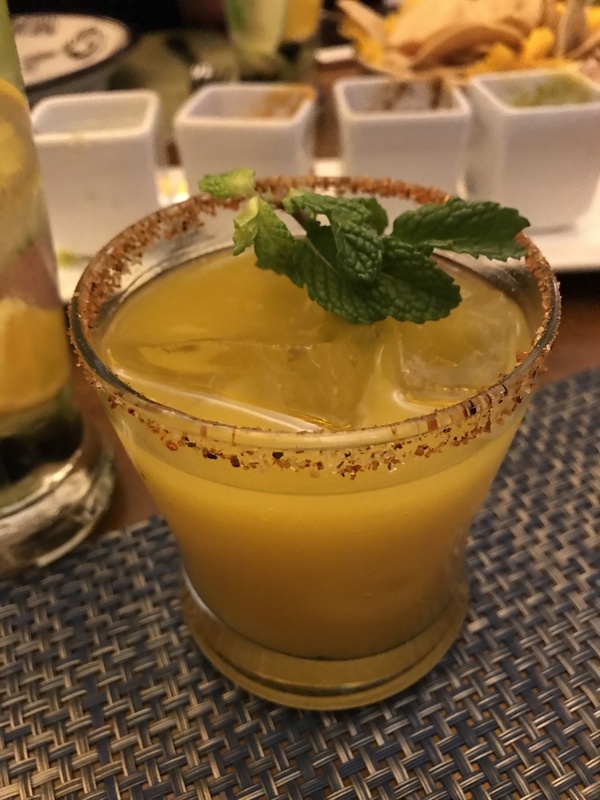 The cocktail list is wonderfully curated with drinks that feature mezcal, tequila, sake and local ingredients. The salt and seaweed rim on the Choyerita made this the pick of the night. 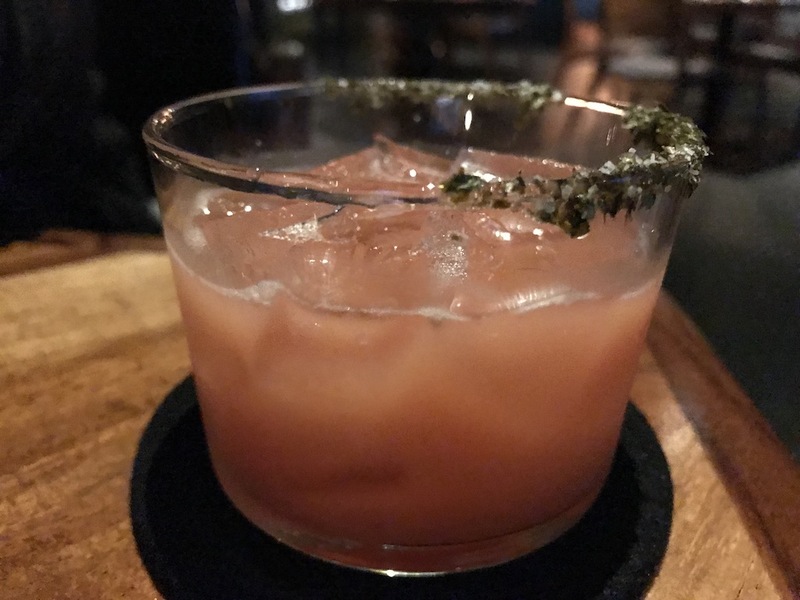 The perfect way to start our festivities, this festive cocktail has lemon, prickly pear, watermelon, pink pepper syrup, togarashi, damiana liqueur and Casa Dragones Blanco. I must also say that their wine list was quite extensive and provided wonderful pairings throughout our dinner. Every dish was prepared lovingly and beautifully plated. We sampled many of the appetizers and main dishes. The blend of Asian and Mexican flavors was unique and very sophisticated. Manta Restaurant watermelon salad tomato raspberry and hibiscus chamoy. Manta is a restaurant to enjoy with friends. That way you can sample and share many dishes. Limiting yourself to only one or two would be something you’ll regret for some time to come. If you’re looking for a place that has an active pool and beach scene ME Cabo is for you. This is not your father’s luxury resort. The pool has a drink menu longer than any I’ve ever seen with everything from frozen cocktails to a long champagne list to beers and wines. This is the place of Internet moguls and fashion models. But don’t worry. Folks like us are welcome there too. Just put on your dark sunglasses, order a drink and watch the party begin. When you’ve had your fill of the pool check out the poolside Blue Marlin Ibiza Restaurant. 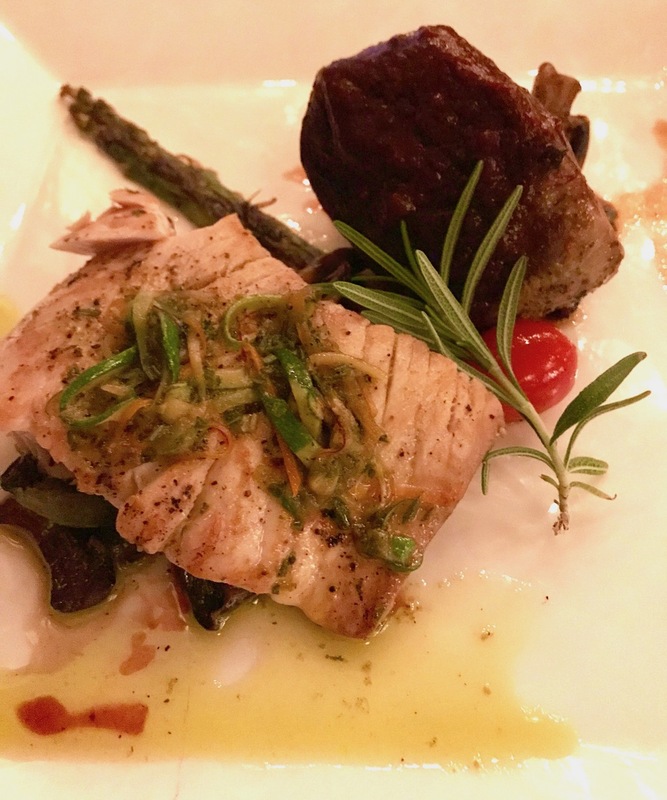 Here you’ll find a blend of Mediterranean and Asian culinary influences with many fresh fish options on the menu. 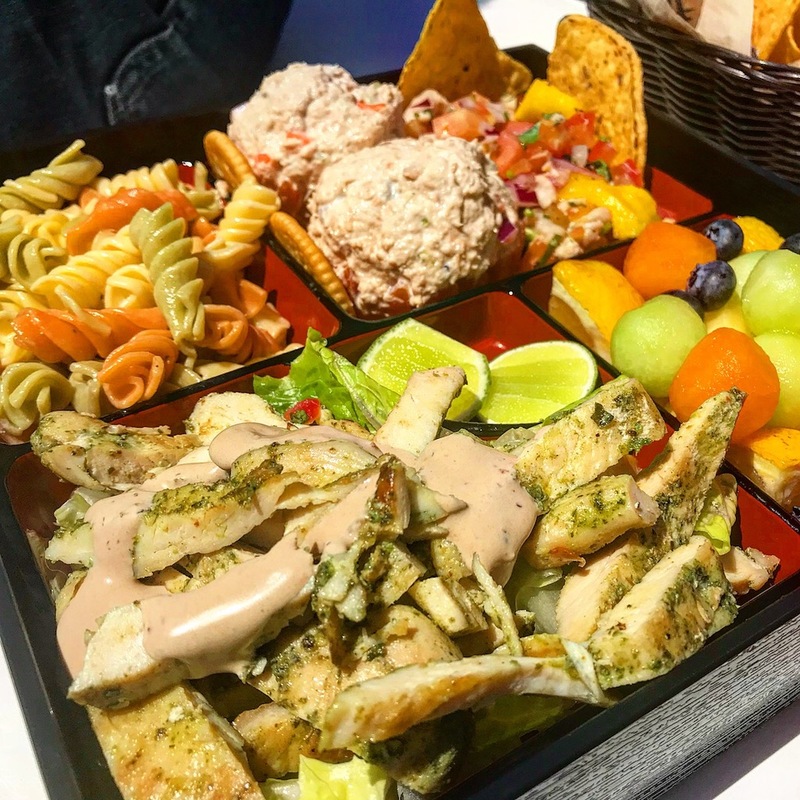 The ceviche, sushi and fresh fish choices would be enough but the menu also features sandwiches, salads, and desserts that are perfect for this fun in the sun location. 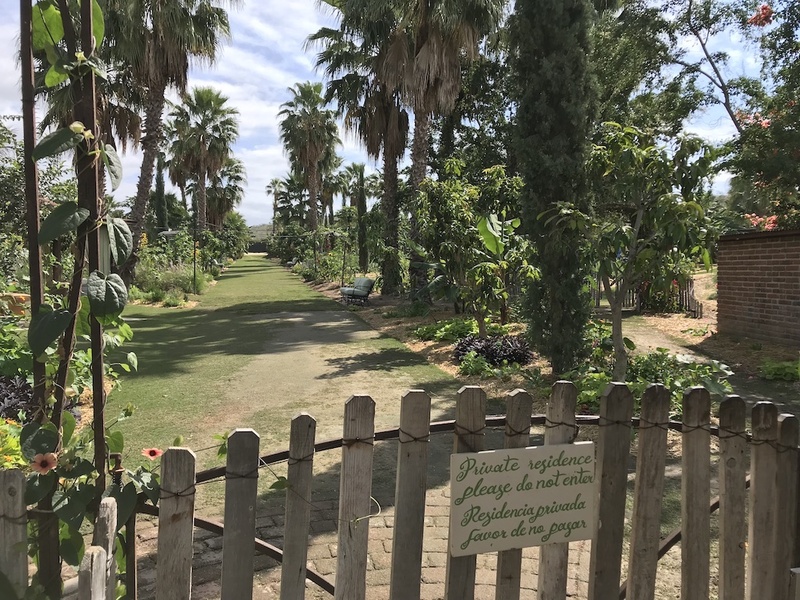 If you’re looking for a place that makes you feel like you walked into foodie heaven from the moment you arrive Flora Farm is the place for you. It’s a farm but it’s more like Disneyland for foodies. You can literally go from place to place on the farm discovering new and even better spots than the one you thought was the best before. Sound crazy? It is. When you first walk into the Flora Farms oasis the lush park-like setting just takes you away. You immediately forget the journey in along the long dusty bumpy dirt road that you thought would never end. Started by Patrick and Gloria Greene over 20 years ago this 35-acre farm has turned into a foodie mecca. The neatly manicured farm produces seemingly perfect vegetables and fruits. We were scheduled to take a cooking class but little did we know we were in for a real treat. 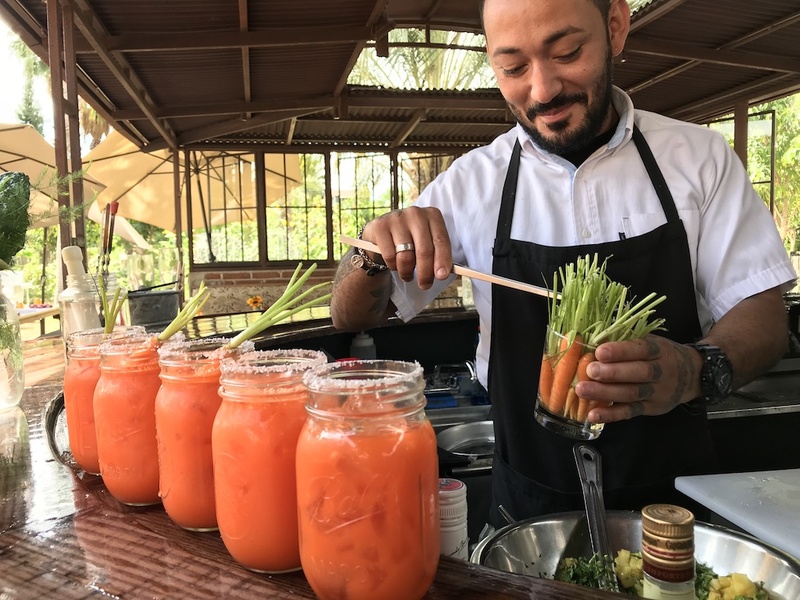 Our first stop was Flora’s outdoor Farm Bar where we watched our bartender prepare these carrot juice margaritas, the Farmarita. One could argue that this was really more like a health drink so sipping it before noon was acceptable, right? We entered the cooking class area and were greeted with a table loaded with fresh vegetables and ingredients. I was hungry just looking at it all. Our friendly teacher taught us how to make guacamole, pico de gallo and salsa. We also tried our hand at tortillas and I can say there’s nothing better than freshly made tortillas. There is a little bit of a trick to making sure you get just the right amount of corn mixture on the maker and that it’s in the middle of the tortilla maker exactly but once you get the hang of it, it’s actually is pretty simple. After our cooking lessons, we had what is best described as a workman’s lunch. It was enormous. 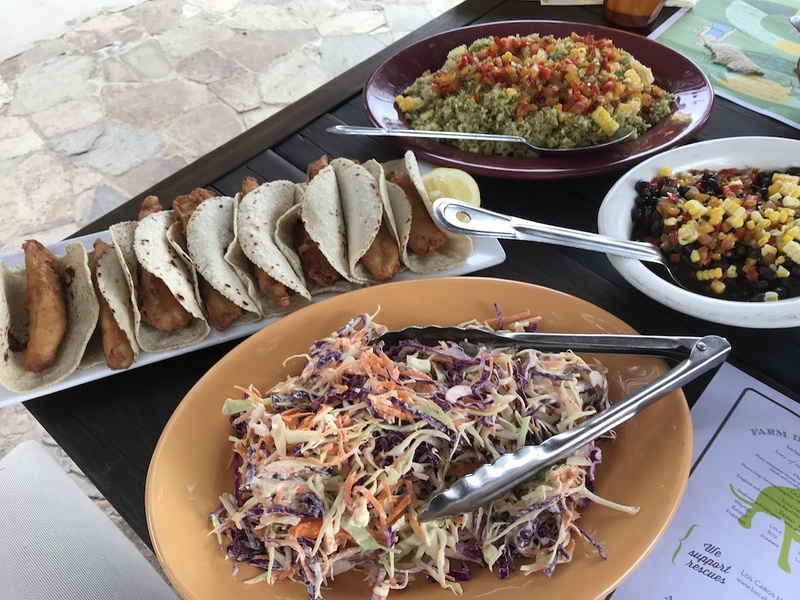 We ate all our dishes as well as fish tacos (the best we had while in Cabo), rice, coleslaw and a corn and bean salad. The only thing we needed after this meal was a hammock to fall asleep in. There is a full-service restaurant Flora’s Field Kitchen, an in-house bakery, a fully-stocked market, and a Farm Spa. They have a brick pizza oven that we hear produces some of the best pizza in Cabo. I guess we’ll have to return to find out for ourselves! Flora Farms is also available for weddings and other celebrations. The real intriguing 4-1-1 on Flora Farms is all about the Culinary Cottages. Only 10 exist. We could barely catch a glimpse from behind a gate but we hear that these luxury buildings are handcrafted by Flora’s artisans, who work on staff and also build everything on the farm as well. This lucky and prestigious community enjoys harvesting privileges on the farm as well access to the Farm Spa and other high-end amenities. The bad news. Since there was such a huge interest the real estate is no longer available to the general public. You need a “private invitation” to be considered for any openings. However, we did do a little research and you can book a Flora Farms Culinary cottage on Airbnb for only $1,025 a night. Who wants to go with us? 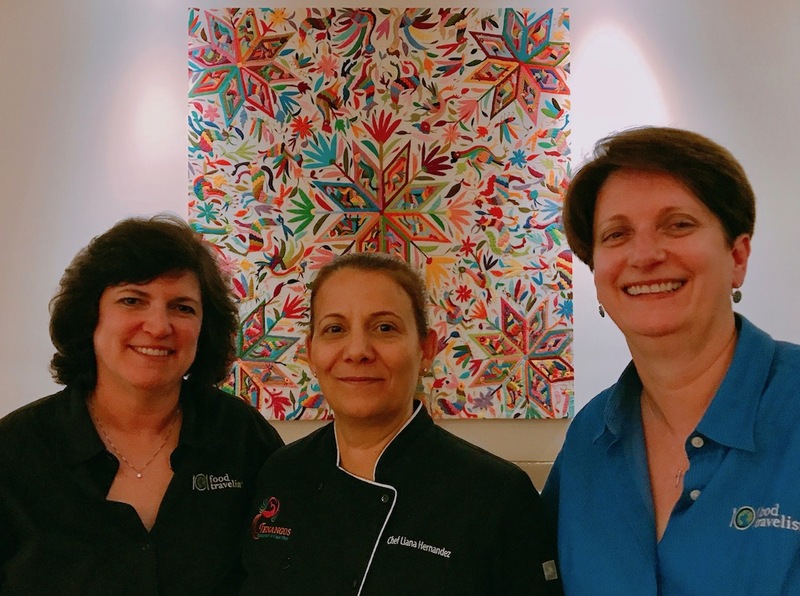 We were also fortunate to be the guests of Chef Liana Hernández Tur at Tenangos Restaurant and Cigar Shop. 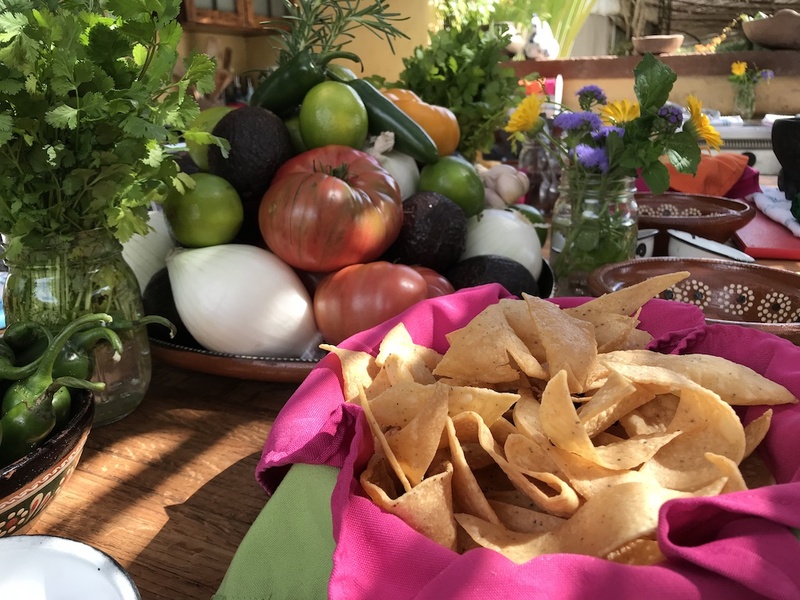 Her menu is inspired by all the flavors, colors and cultures of Mexico. Using courses from every state of the country her menu is a treat for culinary explorers. The meaning of Tenangos comes from the traditional colorful tapestries that often portray flowers and birds. You will see many examples throughout the restaurant and even on the Tenangos logo, which features a colorful bird. Chef Tur says that this symbolizes teamwork and tradition. 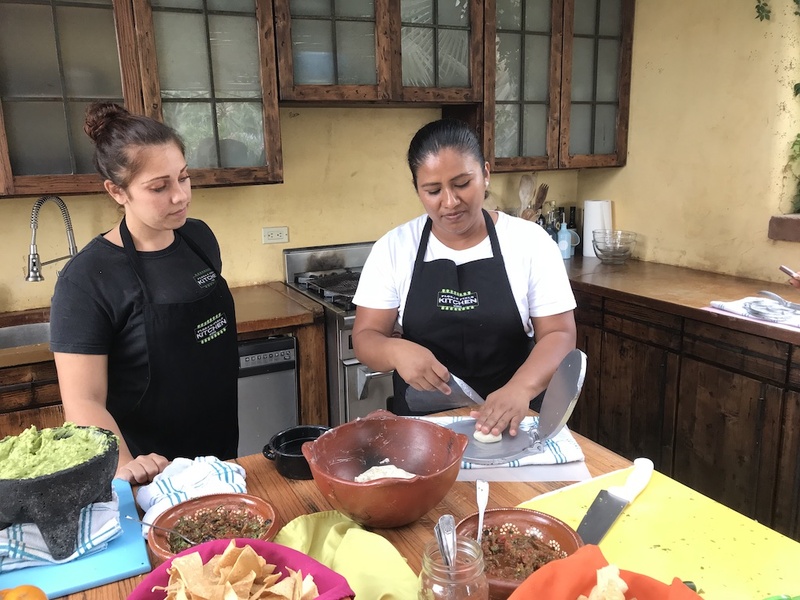 One of the few female chefs in Mexico, she graciously prepared her fabulous dishes and gave us the opportunity to taste her creations. Along with a wonderful menu Tenangos also has a tasty cocktail program that celebrates mezcal. We started with a smokey mezcal cocktail. The first surprise was the Huitlacoche or Mushroom Cappuccino. It looked like a frothy coffee drink but was a rich and sumptuous mushroom soup. 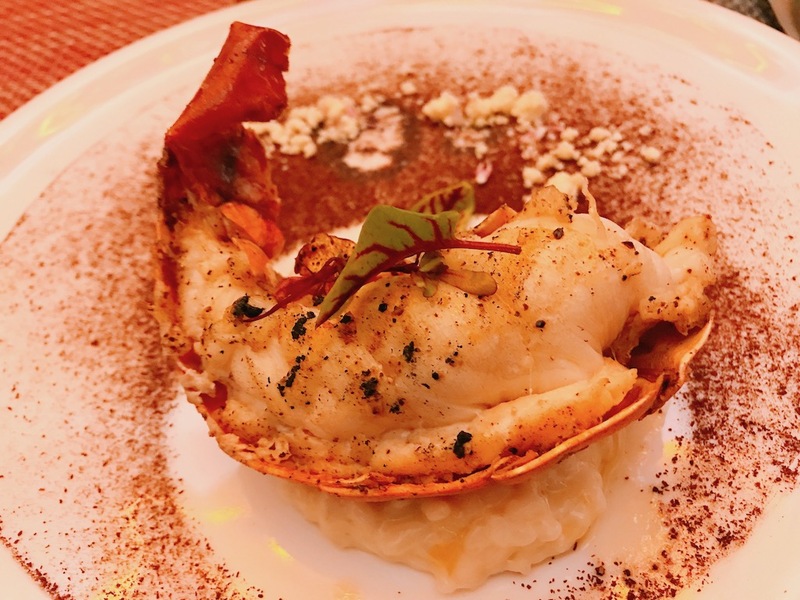 We tasted a black mole from Oaxaca, Chilanga style quesadilla with chorizo from Miraflores and ended with lobster with cream rice and Hibiscus powder. Of course, no meal is complete without coffee and after dinner drinks. The coffee and mezcal cart was entertainment of another kind. 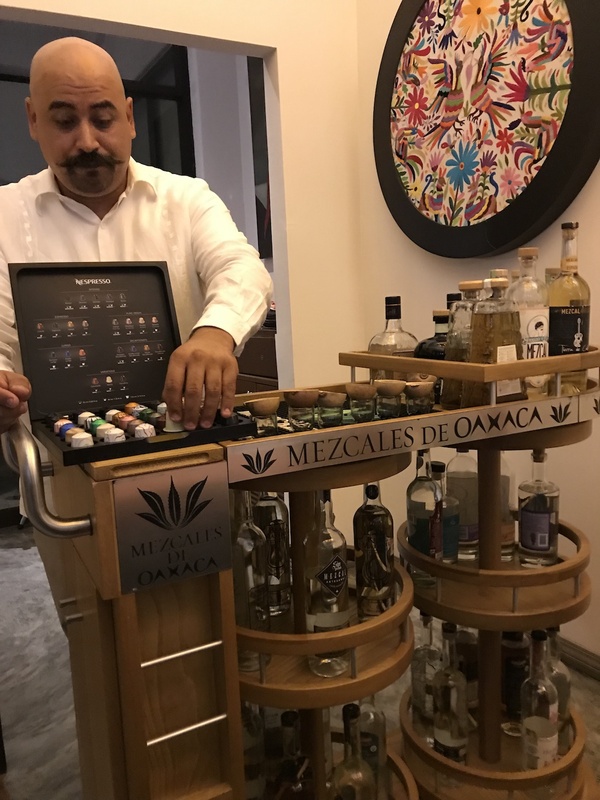 The restaurant features Nespresso coffees and more kinds of mezcal and tequilla than we even knew existed. 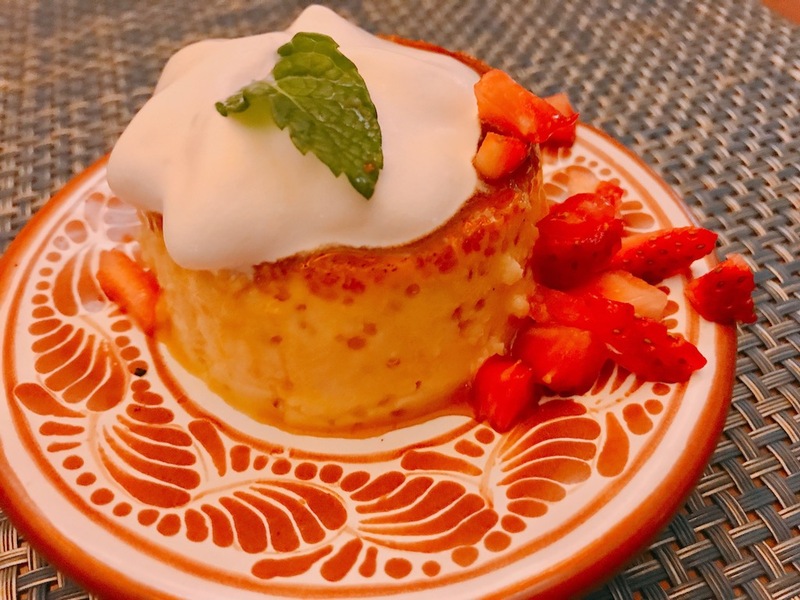 A homemade flan with vanilla from Papantla, Veracruz provided a very sweet ending. Our taste buds truly took a culinary journey through Mexico at this delightful dinner. 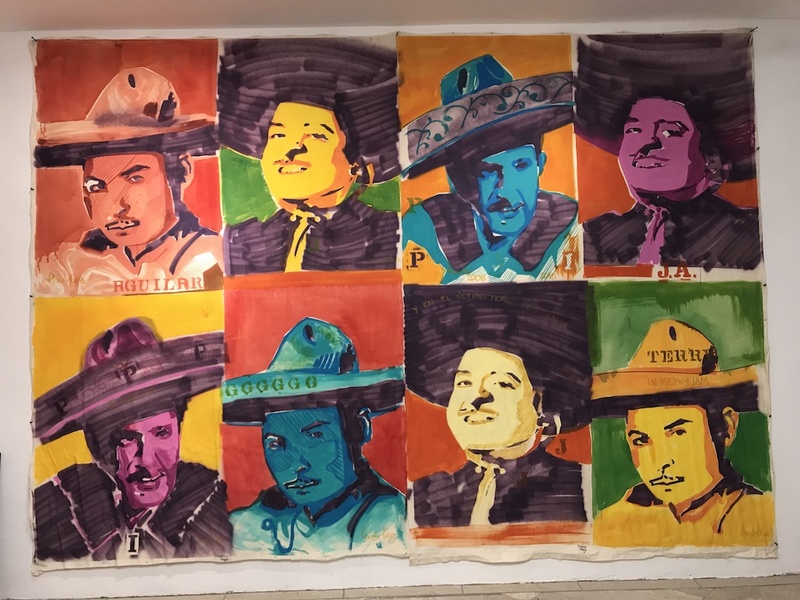 To explore more of the culture of Los Cabo you must take in some of the art scene. 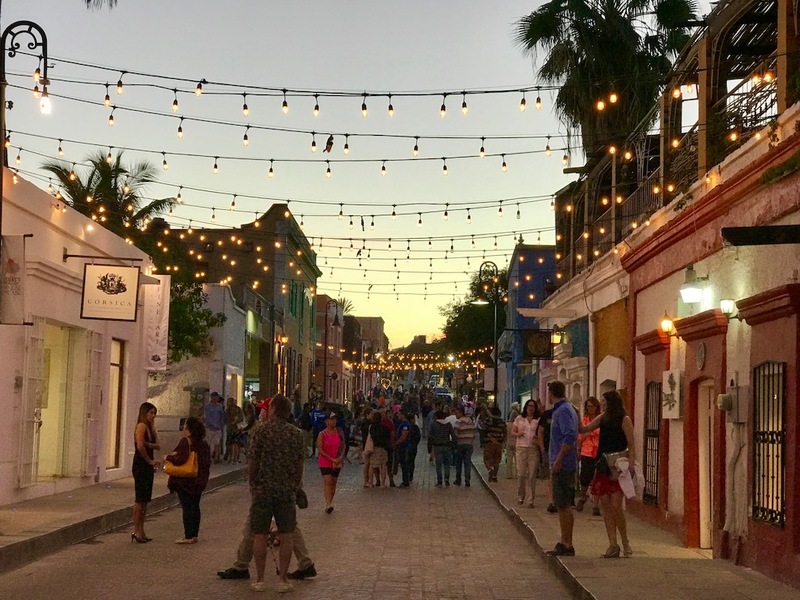 Every Thursday evening from November to June the San Jose del Cabo Art district hosts an Art Walk. Tourists and locals stroll the art district enjoying the local art kiosks and galleries. The area is also loaded with bars and restaurants where you can stop and have a local brew and snack before continuing on to look at more creations. It’s a lively scene with music, twinkling lights and, of course, art. Be sure to stop by the Patricia Mendoza Art Gallery. This exceptional showcase features promising local young artists as well as world-renown virtuosos. Their new second gallery just opened and has a lovely courtyard with sculpture work. During Art Walk, they were serving chilled wine and homemade tostadas made by the owner’s sister to browsing guests. They were out of his world! While you’re in Los Cabos it would be a miss not to enjoy some water activities and you know we would find one that has fantastic food too! 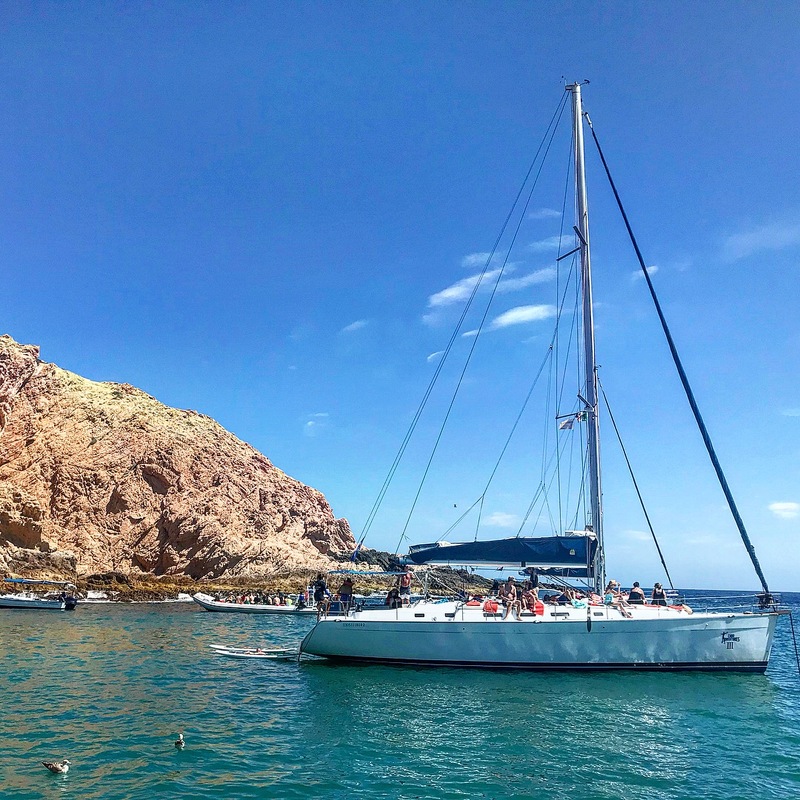 We went on a half day (four hours) luxury sail with Cabo Adventures. About 15-20 guests enjoyed great hospitality onboard a French-made sailing yacht. We were treated to unlimited top-shelf cocktails, beer, and wine. 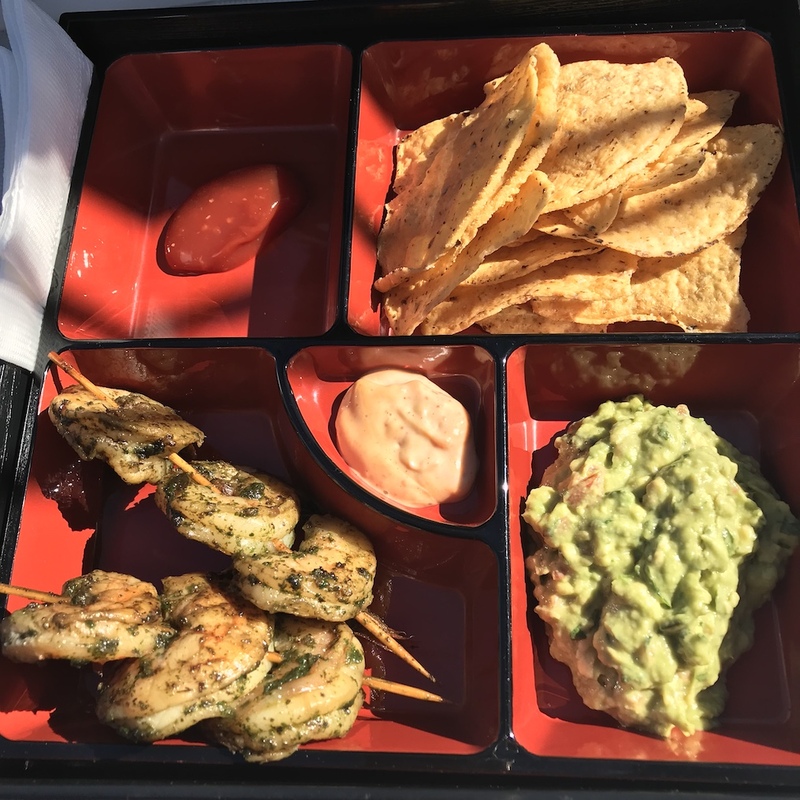 During the sail, we had a snack of yummy grilled shrimp, guacamole and chips. When we anchored in a protected cove we were free to snorkel, swim or paddle board off the boat and they served our plentiful gourmet lunch on the deck. Libations were aplenty too. The sail took us past the famous Arch. We didn’t spy any dolphins on our sail but they do often see dolphins, whales and stingrays. This all-inclusive sailing adventure is perfect for just about any age. The crew see to your every need – even if it’s just making sure your drink is always full. A wonderful trip about an hour from Los Cabos in Todos Santos. This former sugar cane producing beach town is now a place known for its artists and many galleries. This is a funky little town where you can expect to find tourists, fisherman, surfers and freewheeling hippie types all happily wandering around. The hum of activity adds to the charm of this special little corner of the world. Not overtaken by tourists (yet) it’s easy to stroll the streets leisurely and haggle with the artisans for handicrafts to bring home. 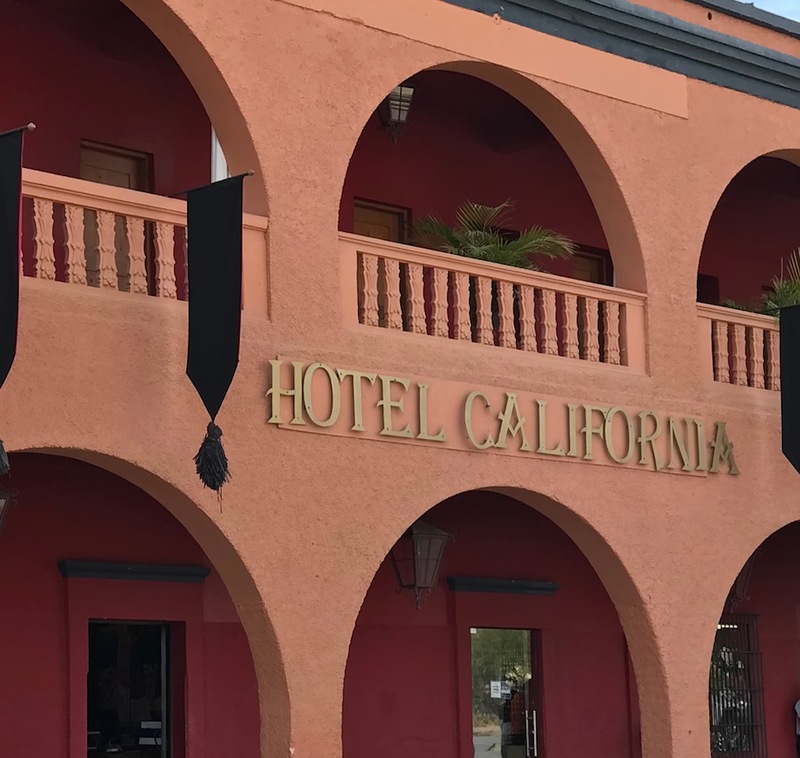 You will see the very popular Hotel California and although the locals will cheerfully tell you otherwise, it is not the hotel you can’t ever leave, made popular by the Eagles in the ’70s. But they do have a bar and restaurant as well as a hotel. A delicious meal with an outstanding view is something we think everyone enjoys. And views don’t get much better than the one at El Mirador Ocean View Restaurant. We were fortunate enough to get there right at sunset. After enjoying our cocktails we sat under an open-air palapas where we could feel the cool ocean breeze. 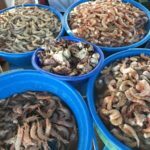 I can’t say enough about all the wonderful seafood we had while in Los Cabos. 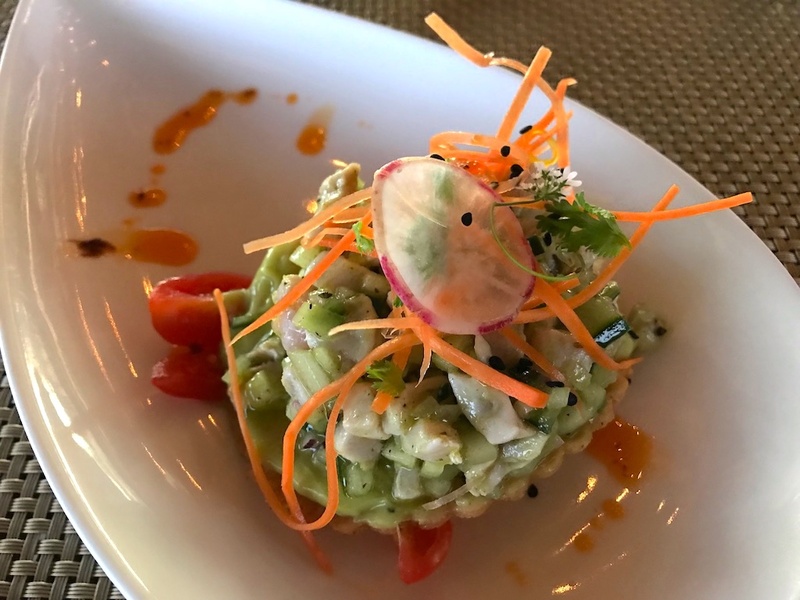 The El Mirador presented us with a beautiful fish ceviche over a tostada in green salsa, a perfect light starter. From there we had a hearty fava bean soup with nopal. For our main course, we had a duo of surf and turf including the grilled catch of the day Bajemed style and beef medallion in classic pasilla chile sauce. Our remarkable dinner certainly had stiff competition from the ocean waves and the gigantic full moon that rose while we were dining. We truly loved the experience of sharing our mint and chocolate mousse dessert while under the moons glow. 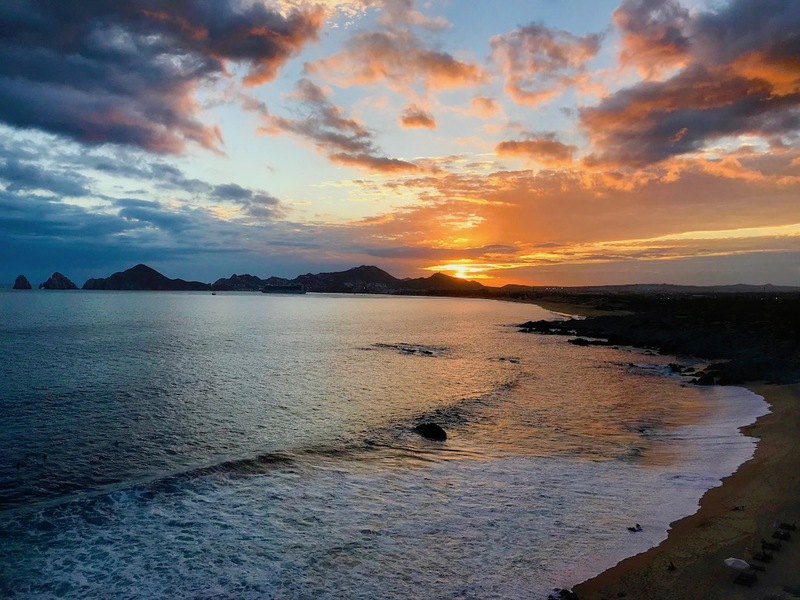 As you can see Los Cabos is the perfect destination for high-quality resorts, delicious locally sourced foods as well as all the sun and water activities you would expect. 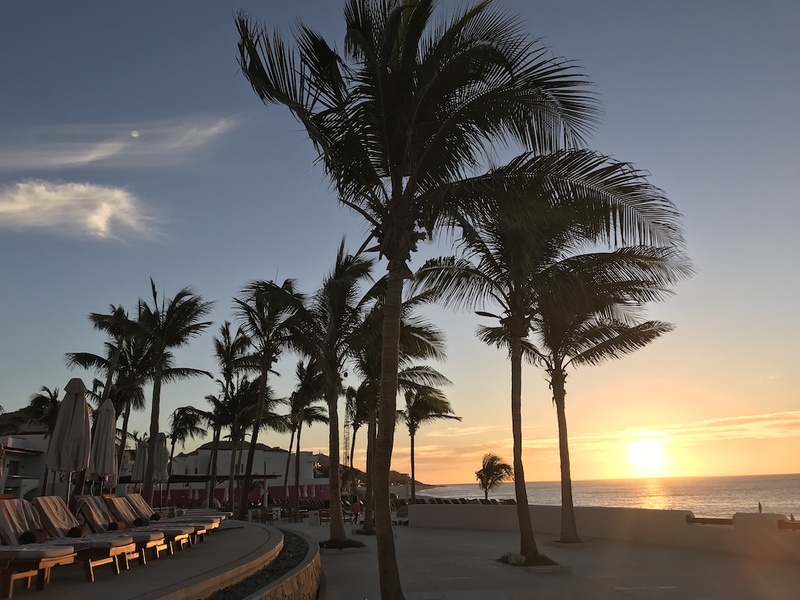 For more information on visiting Los Cabos and booking your next vacation go to Visit Los Cabos for all your trip planning needs. Glad I came across this. We are looking at 2-3 weeks in Los Cabos early next year and are always concerned about finding great local food. It is Mexico afterall and most places have great food. Thank you very much for the post. That carrot margarita also looks pretty interesting. I love reading your blog, I follow closely all the tips, Thanks for sharing these tips, so that we can have the best tour. Glad to read this post and really very useful it is. 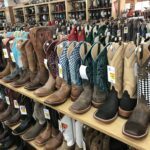 I wrote home one of the tips for my next trip. Sounds like an amazing country to visit and eat! I might just have to go for lunch a few hours early! Wow, what an incredible trip of tastes you had! Hmm…where to start? Eating guac from a bento box was very clever and that carrot juice has my mouth watering. 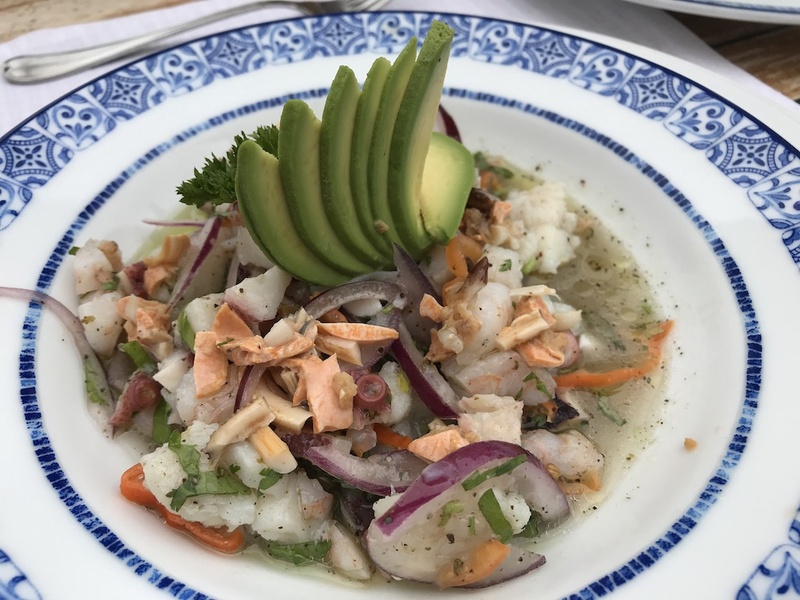 Ceviche!! I can’t go on or I’ll be daydreaming about this post for the rest of the day and no meal will satisfy me. 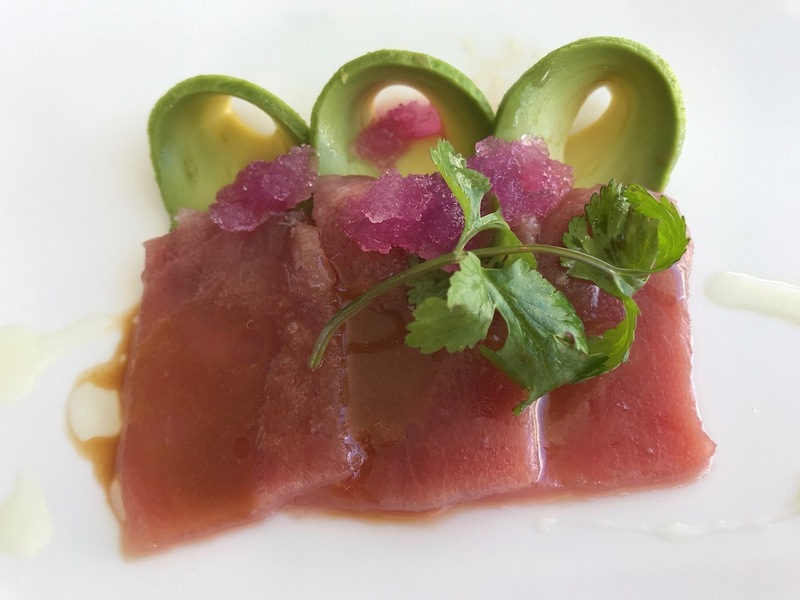 Los Cabos is quite the foodie destination! 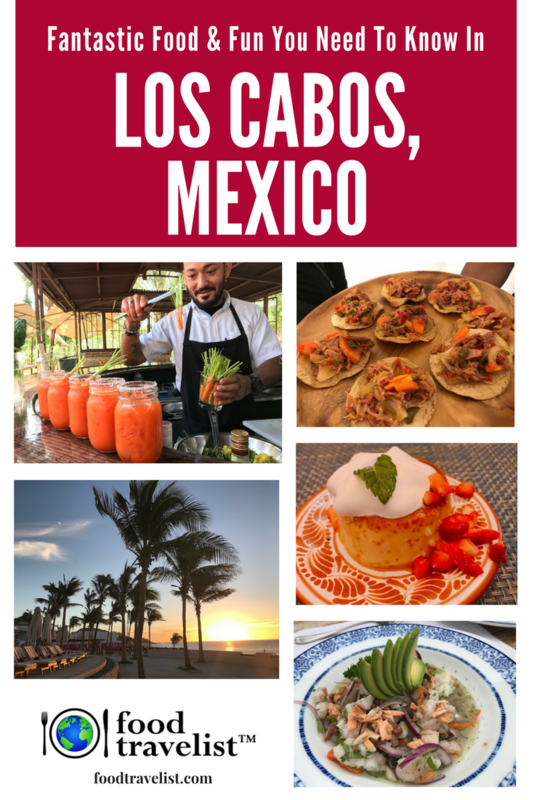 We’ve traveled to Los Cabos for many years so thanks for reminiscences of some of my favorite places (the Marquis and Flora Farms) and introducing me to some new experiences. Los Cabos is magical! WOW, what’s not to like? Fun, food, luxurious accommodations and glorious sunsets! I really enjoyed reading about your Los Cabos, Mexico holiday!! Beautiful! WOW!!! this is one of the tastiest posts I’ve had the pleasure of reading! I’ve been to Los Cabos once, but just from a cruise ship for a catamaran snorkelling cruise. It was fantastic and I’d love to go back. 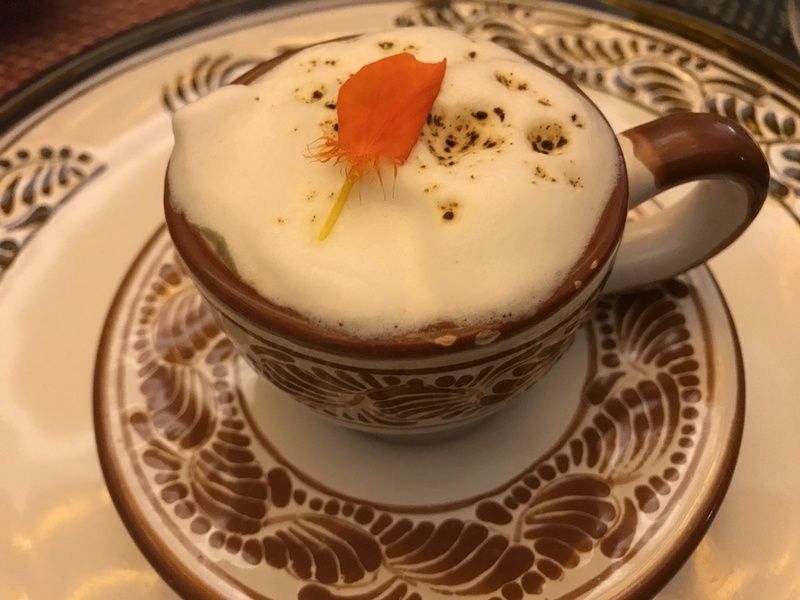 Of all the delicacies you’ve tempted us with, I think the Mushroom Cappuccino at Tenangos Restaurant is the one that has intrigued me the most. 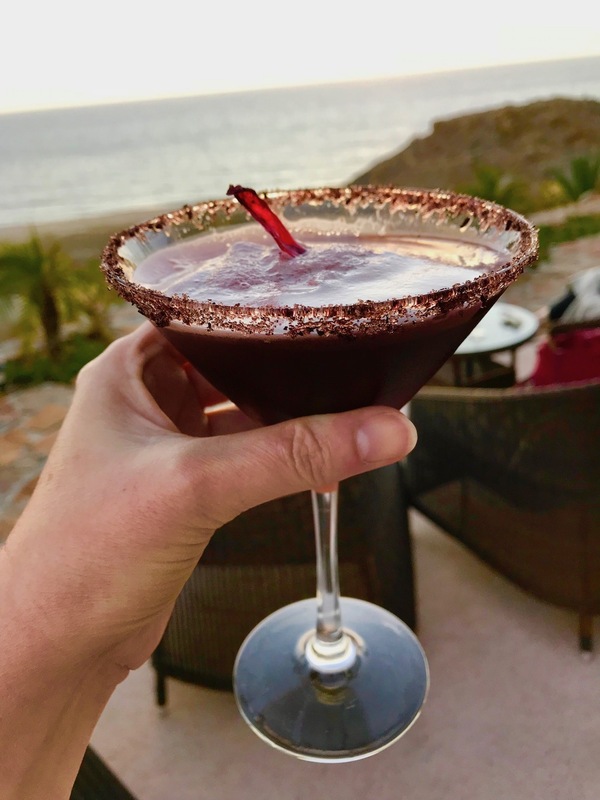 Well if Los Cabos is full of delicious food and stunning vistas like I can see in your post then I am clearly ready to jet off on a plane right now. What would you say was your favourite resturant out of all the ones you had visited? Hi Ana! That’s like asking who’s your favorite child, right? I’d have to say that I loved Tenangos having a female chef prepare foods from her homeland is really special. Best part of traveling is going and enjoying the food. 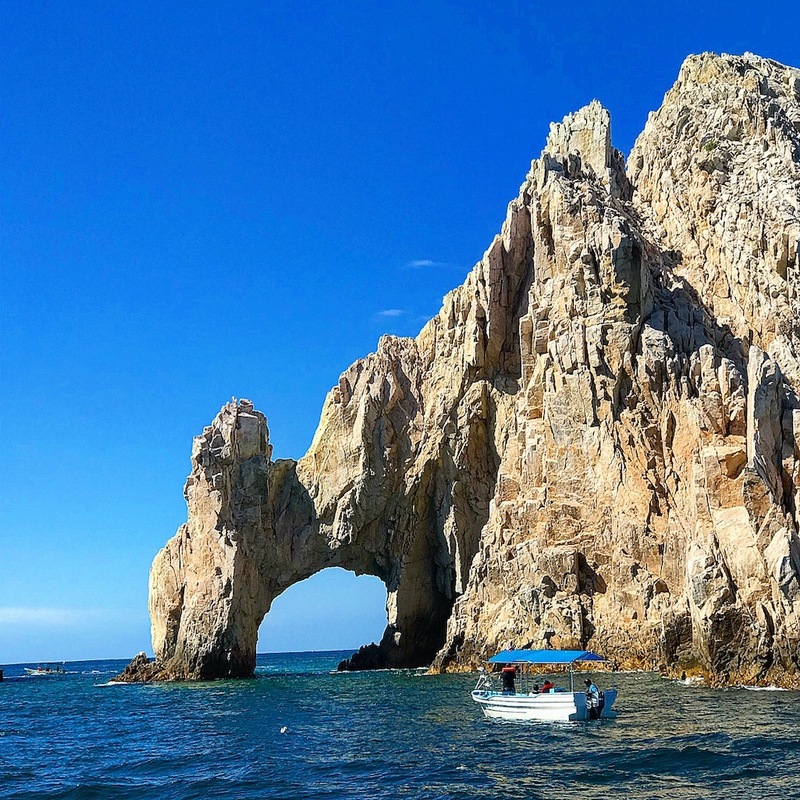 We hope to visit Los Cabos one day. Your photos have me wanting to go TODAY! Looks like a great vacation spot to me. Oh wow! The food and the cottages are what really stand out to me! I would love to visit Los Cabos! I have heard so much about it but you totally brought it to life with the visuals! I’ve wanted to visit for the outdoor adventures but now even more for the food scene too! Hard to decide what I would like best but Flora Farms intrigues me. Wow! Looks like you had an amazing, beautiful, and tasty trip. Stunning views and gorgeous colors seem to be everywhere. Oh, how I miss sunshine! I can’t wait for the dreary spring to be over with when I see your beach photos! This looks like a dream trip to me. I just started researching to plan a trip for our 20th wedding anniversary, have no idea where we will go but we have two years to plan it. I can’t get over how lovely the food is in your photos. All of your photos look amazing. I bet it was even better in person. Your pictures are so beautiful. They make me want to travel, eat, and drink. I have never been to Los Cabos but I am ready. 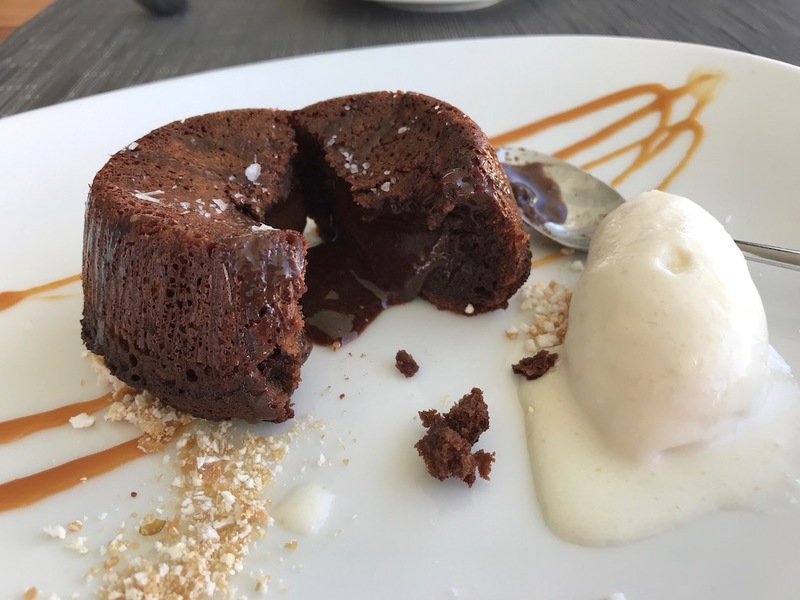 The Chocolate Lava Cake dessert caught my eye right away. Looks like a fabulous trip! Oh this looks like a beautiful place to visit! Look at that water!!!! Wow that looks like a great place to visit. I have never been one to want to leave the country, at all but this looks like a great way to relax. The food is something that I always worried about but it sounds amazing there and I really want to look into visiting in case I ever get over my traveling fear! Gosh, that looks gorgeous! What a beautiful place, I coudl not imagine getting used to that kind of view. When do you get to go back? Los Cabos looks like paradise. The food, of course, makes one think that the place must indeed be the mecca of food. The Doughnuts were what riveted my attention. 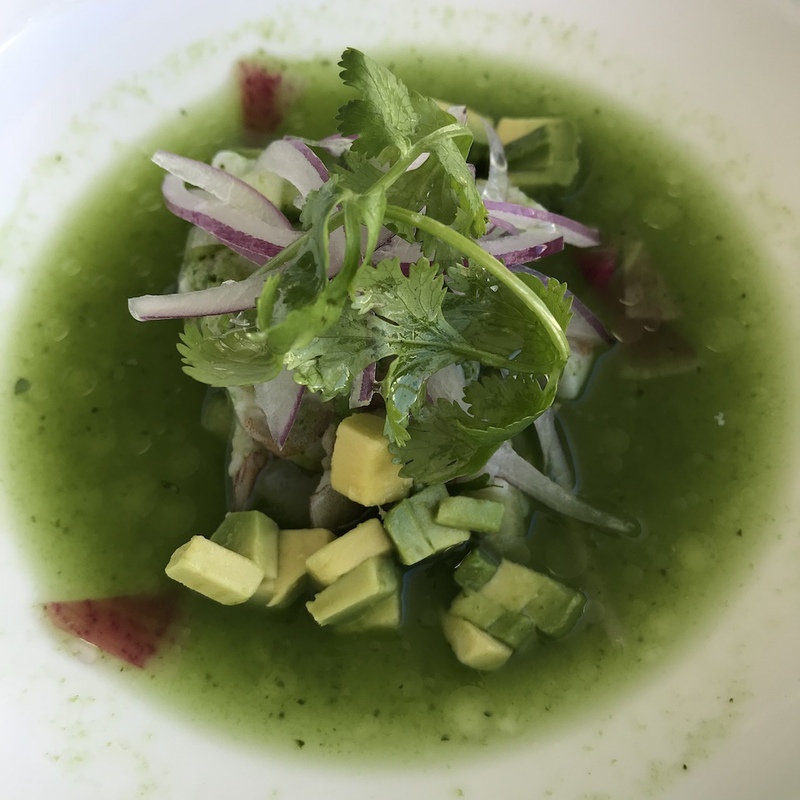 Wow, Los Cabos is getting as sophisticated with its food as the rest of Mexico! You had me at the butler’s pantry, which I’d like filled with those gorgeous donuts and some Mexican hot chocolate, thank you very much. That carrot margarita also looks pretty interesting. Ole. I have heard many people say great things about Los Cabos but have never been myself. It looks wonderful – art, fantastic food, and the beach.